To mark its 70th anniversary this year, Canon updated its Digital Ixus family this morning. 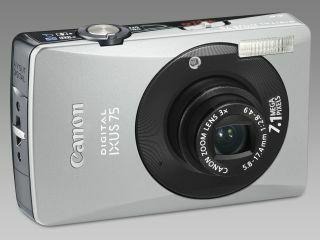 Two new Ixus models were unveiled; the Canon Digital Ixus 70, and the Canon Digital Ixus 75. The Canon Digital Ixus 75 is one of the sleekest Ixus versions we've seen from Canon. Available in a brushed silver metal finish, the Digital Ixus 75 features face detection technology and improved red-eye reduction technology for perfect photo results. The Digital Ixus 75 has a 3x optical zoom, a 7.1-megapixel CCD sensor, and a maximum ISO setting of 1600. Its 3-inch LCD screen takes up most of the back panel and is perfect for easy previews of photos. The Canon Digital Ixus 70 is Canon's slimmest optical zoom camera to date, measuring just 19.4mm deep. It also features face detection technology, and comes in black or silver finishes. Like the Digital Ixus 75, it has a 3x optical zoom and features 7.1 megapixels. It has 17 preset shooting modes and can shoot VGA movies at 30fps. The Digital Ixus 75 is priced at £269 and the Digital Ixus 70 costs £249. Both will be available from March.